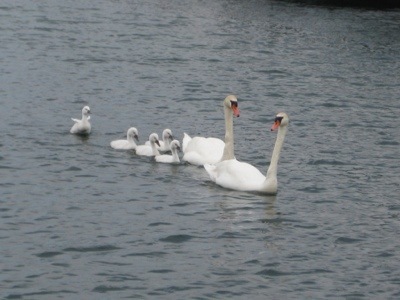 We once again have a swan family that calls the marina where we berth Annwfn “home.” During the year, the swans seem to live in Duncan Bay and the surrounding waters around Cheboygan, but once they have hatchlings, they spend a lot of time in the marina. 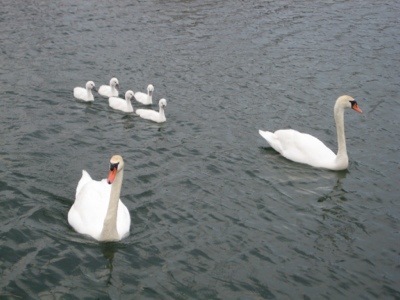 A few years ago, we enjoyed the swan couple with their many cygnets, but as the month of June wore on, their cygnets decreased in number one by one until they were left with one lone baby swan surviving the predators here. So far, this swan family seems to be doing well. They still have all five of their hatchlings. We hope that there aren’t many large pike lurking in the clear waters around our docks.